A little over a month ago Japan Centre opened new restaurant, Shoryu Ramen. Not content with holding the crown for tempura, sushi and other treats at Toku and umai, we branched out into ramen noodles too. Given 4* by Time Out and enthusiastic newspaper and blogger reviews coming in thick and fast, Inside Japan Centre decided to send some of our food-fanatic Japan Centre team over to Shoryu to give you our own review, as we (greedily) were able to sample quite an extensive amount of the menu in one go! In all we tried 6 of the noodle offerings: the classic Hakata Tonkotsu, Yuzu Tonkotsu, Wasabi Tonkotsu, Karaka Tan Tan Tonkotsu, the Tokyo Shoyu and the Natural. 4 sides: gyoza, kimchi, shishito peppers and seared salmon wakame salad. 2 desserts: Matcha Ice Cream, Azuki & Matcha Roll Cake and 3 drinks: Horin sake, Kirishima shochu and shiso herb-infused Red umeshu. After being greeted by a friendly ‘irrashaimase!’ (welcome) from the staff, we were seated at one of the comfortable banquette booths by the contemporary brick wall covered in Shoryu designs. Warmly-lit with a real ramen-ya hustle and bustle, the place was busy with diners – groups of office workers, students, lone businessmen and families, everyone seemed at home tucking into their noodle bowls. We scanned the menu (9 types of Tonkotsu and counting) and followed the helpful suggestions from the waitress, going for the best-selling bowls. The menu covers all you would want, from noodles, sides, extra toppings (even ‘kaedama’ noodle refills, amazing), desserts and drinks, however variation seems to be the name of the game and we have since seen some further lip-smackingly good menu additions such as Tori Kara Age Men (we love a bit of fried chicken), another excuse to go back. Our order arrived prompt and piping hot, just the way the broth is supposed to be. After a bit of oohing and aahing we dived in, sharing a bit of each bowl to try as many of the flavours as we could. The classic Hakata Tonkotsu was seriously delicious, the rich tonkotsu stock still retaining some lightness – it didn’t have that greasy feeling you sometimes get with tonkotsu ramen. Neatly topped with char siu bbq pork, gooey nitamago egg, kikurage wood ear mushrooms, beansprouts, spring onion, nori, ginger and sesame I was in ramen heaven. While I also tried the Tokyo Shoyu Ramen and the Natural, which were equally tasty, I am a committed porkaphile and could not resist the siren call of the tonkotsu, devouring most of our tonkotsu based samplers before the others got a look in. The other variations on the tonkotsu theme tried were the Wasabi Tonkotsu, Yuzu Tonkotsu and Karaka Tan Tan Tonkotsu Ramen. Both the yuzu pepper paste and wasabi greens & oil added a fantastic depth to the ramen and were probably our favourites out of everything. Don’t be afraid of the wasabi, one of our ‘expert’ (i.e. hungry) testing team does not deal well with spicy foods but still really enjoyed its horseradish punch. The Karaka Tan Tan was a beautiful garlic and miso marinated minced pork topped bowl, with a bite of chiu chow chilli oil to clear the nostrils. Definitely one for spice-fans. 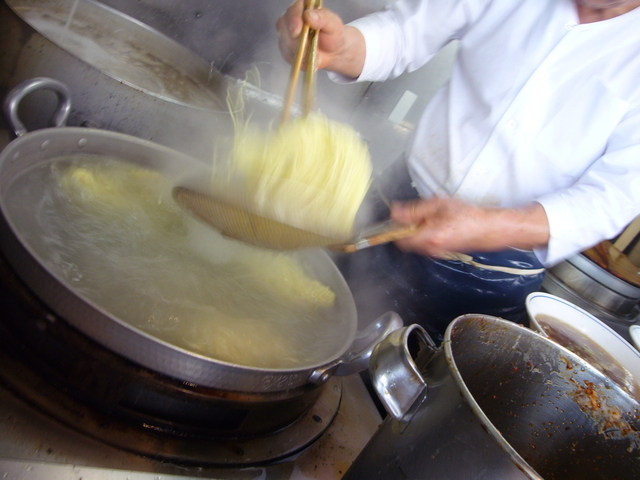 A lot of people have been keen to find out about the noodle-situation – as they are one of the most important components to a ramen dish. 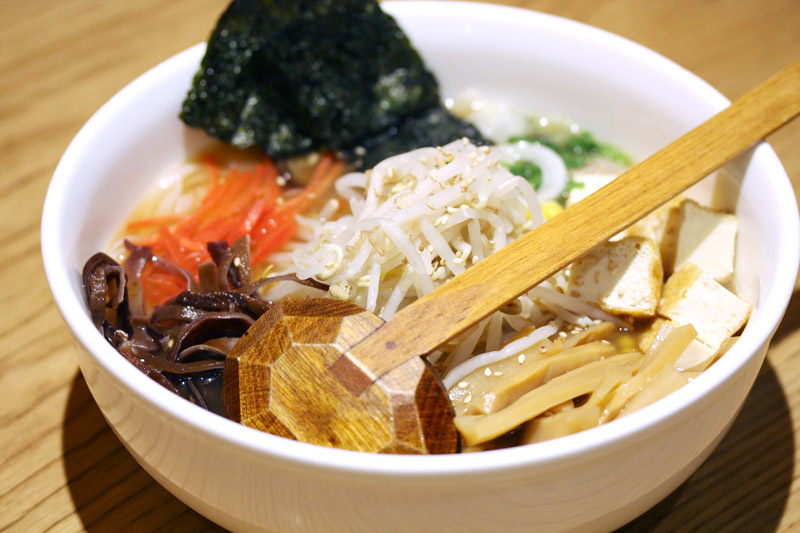 Made to order in conjunction with a Japanese noodle-maker these are pale, straight noodles as should be served with Hakata Tonkotsu ramen. The noodles were cooked to perfection, bouncy and chewy, but just porous enough to soak up a good amount of the stock without getting soggy. The kikurage mushrooms were also a really good edition to all the dishes; stopping you getting palette fatigue between the rich stock and slurpy noodles, their crunchy texture was very refreshing. Let’s talk a little about the sides, every good ramen-ya needs their best supporting actors and actresses and Shoryu doesn’t disappoint. Now you can’t serve ramen without gyoza, and Shoryu’s gyoza were superb. Nice and crispy but with a juicy filling that packed a delicious porky, nira punch. Made from the same tried and tested hugely popular umai recipe, if you’re an umai fan, definitely check these out. One of my favourite gyoza-eating habits is the satisfying ping as you pull the crispy pan-fried skins apart with your chopsticks. Shoryu’s gyoza behaved perfectly and combined with the dipping sauce were little pot-stickers of heaven. I found the real star of the sides however, were the grilled shishito peppers. Roasted with sea salt and yuzu, these little green pods made a great snack with our beer and shochu. Although they look like chillies, they’re actually finger-sized green peppers with a great savoury crunch. They also have a Russian-roulette element to them in that 1 in 10 are spicy…but you can’t tell until you bite into them! Much like the peppers our kimchi was also a fantastic side. Sliced cabbage lightly mixed with a rich chilli and garlic sauce gave a very smooth, spicy kick – a great match to the rich ramen stock. I was pleasantly surprised by the drink selection at Shoryu. All too often drinks are a second thought. Their great selection should come as no surprise as Japan Centre has one of the largest sake selections in the UK and this is reflected in Shoryu’s offerings. We tried a flask of the Gekkeikan Horin sake and some of the Kirishima shochu, as well as some special shiso herb umeshu. Often people are reluctant to enjoy stronger spirits with their meals, but I feel you would definitely be missing out if you went to Shoryu and didn’t try any of the sake, shochu or umeshu with your ramen, especially as shochu is native to the island of Kyushu, the birthplace of tonkotsu ramen. The shiso umeshu had a strong and sweet flavour, but was far from overpowering. It actually went incredibly well with our azuki and matcha roll cake and matcha ice cream. I have to make another confession here, I am not really an azuki or green tea fan, sometimes a little too bitter for my liking. However the roll cake (light and sweet, with a delicate flavour) and the matcha ice cream (creamy and very refreshing) were delightful. The matcha ice cream is made by Shoryu, using Japan Centre’s very own freshly stone ground matcha! You can actually see the stone matcha grinder on display at the back of Japan Centre Regent Street. 1. Shoryu offers value for money. You’ll notice in some of the photos that we had little black bowls of ramen, these are the children’s portions. The big white bowls are actually the satisfying huge ‘standard’ sized bowls, unlike some places, Shoryu’s bowls really are large! 2. As the slogan says, it’s in our bones. 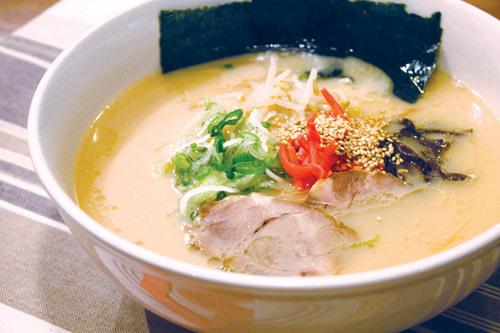 By this Shoryu means that tonkotsu ramen is their passion, it’s in their heritage and cultural roots. They specifically appointed a Hakata-native head chef (the birthplace of tonkotsu ramen) to ensure that they serve the real deal and you can certainly tell. 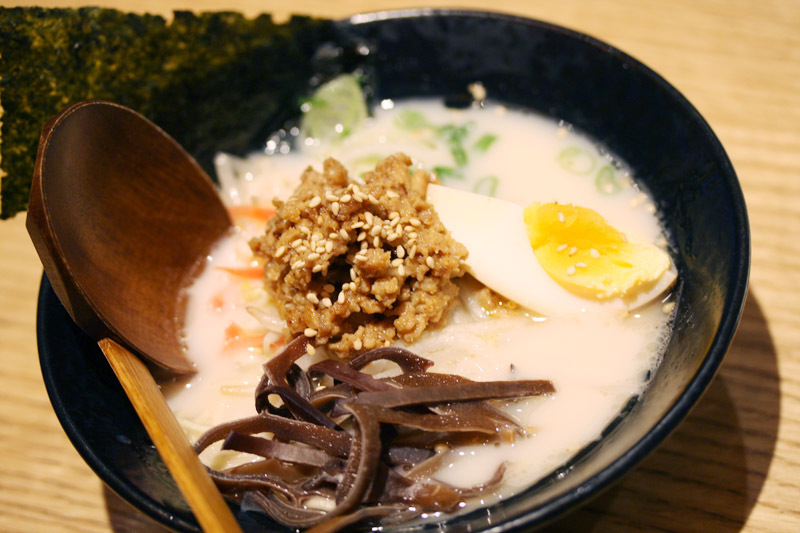 This is tonkotsu ramen as you’ll find in a ramen-ya on the streets of Hakata. 3. Shoryu really values your custom and input. Wanting to serve authentic tonkotsu ramen true to their Hakata roots doesn’t mean they’re blinkered about what they serve. I could tell from the openness of their staff that they value restaurant-patron dialogue highly and it seems popular food blogger Mr Noodles noticed too, calling Shoryu the Listening Restaurant due to the importance placed on constructive feedback. 4. It’s not all pork pork pork. If ramen’s not your thing, there are genuinely tasty offerings for pork-free, vegetarian and gluten-free eaters; a change from the usual restricted selection you have to put up with in some restaurants. 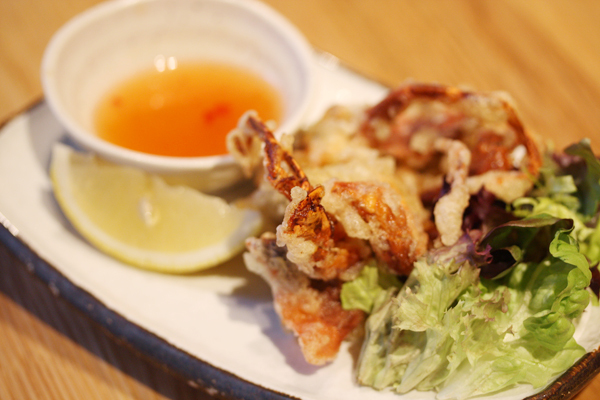 Try one of the amazing sides such as pan fried shishito, soft sell crab tastu-age (gluten free) and the intriguingly named ‘mountain caviar natto’. On top of all of this, before we even got our food, I was struck by one thing. It may sound like a strange thing to say, but I believe at least 50% of what makes a restaurant good is not on the plate. What immediately struck me was how nice all the staff were. OK, so we may be a teensy bit biased, but even still it was really clear how much everyone liked the place and loved the food. Everyone was more than happy to talk to us about how such and such was cooked, or what was in what dish. If you’ve never tried ramen or Japanese food, I really recommend making Shoryu your first stop. Japanese food can seem scary, or restaurants imposing, but I feel Shoryu has a genuinely friendly atmosphere. Verdict: value for money, welcoming, filling, true to its roots. A must visit. Visit our website www.shoryuramen.com or follow us @shoryuramen on Facebook or Twitter. Shoryu Ramen 9 Regent Street, London SW1Y 4LR. Open Mon to Sat 11:30 – 23:00 [Sun 22:00] Closed daily 15:30 – 17:00, last orders 30 minutes prior to closing. 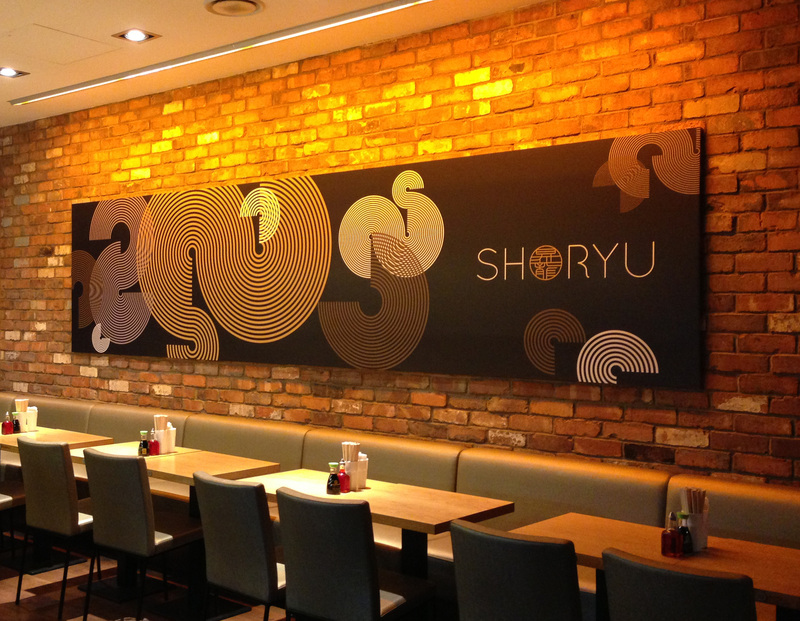 Shoryu Ramen has recently opened a concessions in umai Westfield Stratford City. Posted in Shoryu and tagged Green Tea, Gyoza, Ramen, Sake, shoryu, Tonkotsu. Bookmark the permalink.